Great-grandpa-to-be's heartfelt reaction to baby news will make YOU cry, too! Great-grandpa-to-be’s heartfelt reaction to baby news will make YOU cry, too! Oh my gosh. In a cynical world it can be so heartening to witness truly special moments between good humans. This one, in particular, is happy tears gold! Bianca Rollo shared a video of her pregnancy reveal with the Love What Matters Facebook page, and we are supremely glad she took the time to do so. “I am the first grandchild. So my Papa and I have a special bond, different from my brother and sister. Growing up, we would always do things together. Go on boat rides, go fishing, garage sale shopping, motorcycle rides, ice cream outings. We had a lot in common and always had a lot of fun together,” Bianca told Love What Matters. This mum-to-be is glad of the bond she and Papa had growing up – and now – and knows it will be mirrored in the relationship with the baby she’s expecting. Bianca said that a new baby is an especially welcome and positive addition to her family in the wake of her grandmother’s death 9 years ago. “I was very excited to share the news that my husband and I were expecting with him because I knew how happy he would be that he would get to “re-live” our relationship with his future grandchild,” she wrote. “My grandmother (Baba) passed away in 2008 and over the last few years something has been missing in our family. Even though I know nothing will replace her, it makes me so happy to be able to bring new life into our family,” Bianca writes. Bianca made Papa a cute specially printed t-shirt to announce the baby’s impending arrival. She handed it to him nicely gift-wrapped – as the camera filmed on – and awaited his response. At first he noted that t-shirts weren’t really his favourite thing, but then he saw the message on the shirt and gasped, then sobbed. 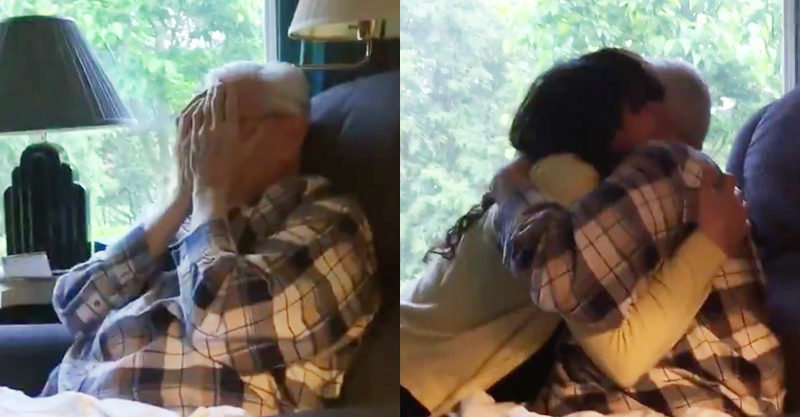 “This is the reaction my 85-year-old Papa had when we told him we were expecting his first great grandchild. He loves t-shirts so we made him one for Father’s Day that said “GREAT GRANDPA to be… December 2017″. My Papa loves his grandkids and I’m so excited for him to meet his great grandchild in December,” Bianca posted. Naw. It’s really such a tender and genuine response to a very special announcement and we feel very lucky to catch a glimpse of it. We think this is just the beginning of even more special moments for this family.